The beginning of a random series of lists of random things that randomly occur to us. At random, like. Except they’re not entirely random as they can all be found in the shop. This week, we turn our attention to toast. Which is coincidentally one of Mrs. Shopkeeper’s favourite foodstuffs. Which may in turn explain why we sell so many things that complement it (and why she is often seen to be brushing away crumbs). We’ll do it in reverse order to heighten the excitement for you, but you’ll have to imagine the drum roll. At No. 10: Camberwell honey. A new entry, as we have only just started stocking it. A light and oh-so-floral blend, it is perfect on crustless Hovis, or warm barberi bread slathered in butter. Start building up your pollen immunity now, and maybe you’ll be able to look Summer in the face. No. 9: Marmite and labneh. Go on – you knew that Marmite would creep in there somewhere. Labneh? Well it’s kind of like cream cheese, although it is actually thickened salted yoghurt. This begs a watercress garnish and some rich nutty wholemeal taftoon bread. No. 8: rose jam. If you could eat happiness, this is what it would taste like. Flowers. Not only is it lovely to wake up to in the morning, but it is a soooper store-cupboard standby for puds (try it in bread and butter pudding, or with meringues). No. 7: muhamara. Which is a nutty, fiery Turkish spread, reputedly the stuff of Anatolian breakfasts. We rather like it of an evening, with French toast or pitta nachos and a bottle of beer. No. 6: mirza ghassemi. This is a smokey Persian aubergine puree, lightly spiced and garlicked. It is traditionally served with a fried egg on top and some dunky bread alongside, but we quite like making it into a Dagwood sandwich by piling it all on top of some toasted khobez bread. Garnish with pickled cucumbers. No. 5: carrot jam. Oh my, this is good. Lovely on its own, or for those that have grown up over the pond, rather splendid with peanut butter too. AND it is a handy thing to have inthe pantry: fry some onions, add carrot jam, and you have an instant sweet and sour caramellised topping. No. 4.: tahina + date syrup. A Turkish and Arabic fave for breakfast. They go together really well, although it can be a little cloying if you get the proportions wrong. Enjoy with crusty toasted sesame bread. No. 3: green olive pate, spread on crispy baby toasts. Top with raw onion, capers and pine nuts, and it makes for a great party canape. No. 2: for the second month running it’s sour cherry jam. It is a perennial favourite, and seems to offer a taste of childhood for Iranians and Turks alike. Mr. Shopkeeper insists it goes on hot buttery white bread, and becomes quite petulant if anything else is offered. No. 1: er, butter. 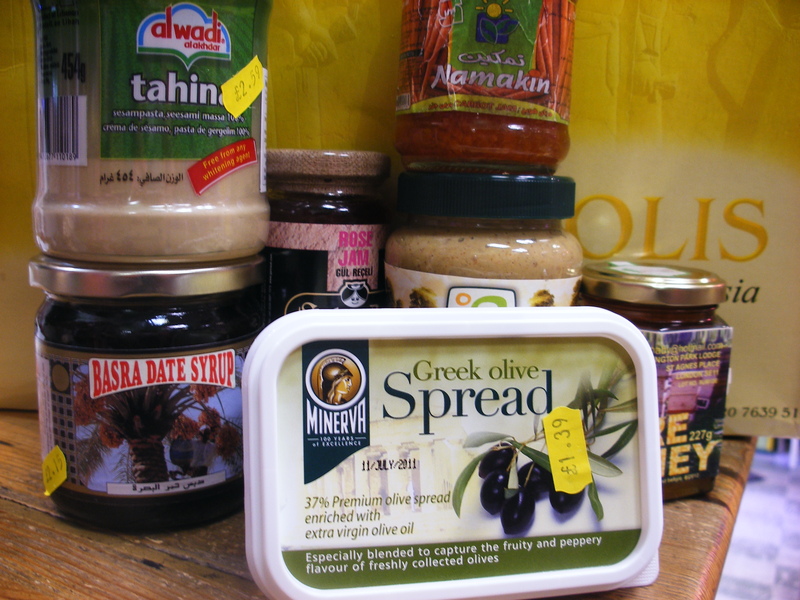 We now sell Minerva olive spread, so that makes it a bit better no? We have a serious butter habit, and there is still nothing like hot buttered toast and tea for those moments when the world suddenly seems awfully heavy. Have we missed anything? And what do you spread on yours? More very silly top tens to follow in the near future.